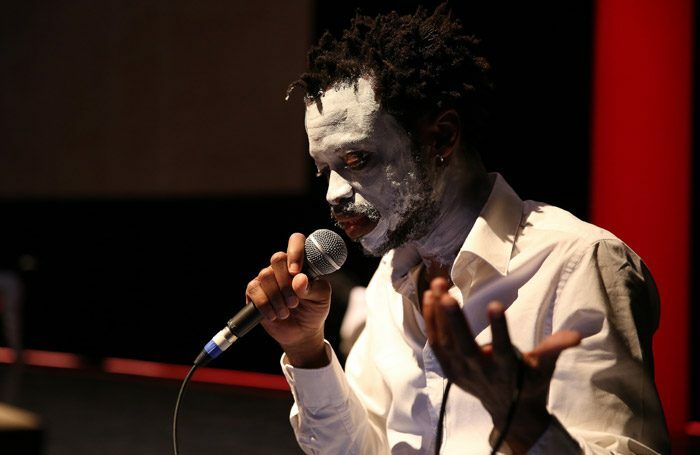 The show, Linyekula tells us, was made as a kind of grave for a friend who died of plague, a burgeoning writer whose scraps of letters and documents spill from a red tin trunk. Scored by fragments of Mozart’s Requiem, it’s a piece fuelled by loss and lament, where even one of the actors – Antoine Vumilia Muhindo – is described as a living ghost, back from the dead, an escapee from a Kinshasa penitentiary where he faced execution for a dabbling in revolutionary politics as a student. A trio of dancers form a writhing ball; upright, they’re drawn into convulsions, their torsos wrenched back, fingers clawed. Agonised spasms morph into winding groin-based grooves, reminiscent of Congolese Ndombolo dance, but their faces remain blank, joyless.